Living in Alaska can be a bit of a gamble, it has been known as the last American frontier for good reason. There are no tribal casinos offering Class III games in the entire state, with only a handful of gambling establishments available offering only bingo and/or pull tab games. It has the largest landmass out of all the states and the lowest population density that has been recorded. It is a true frontiersman’s dream and residents of the state are used to going without. There have been two major gold rushes that have resulted in large surges of population around the major commercial junctions of the state and over time, sparse gambling populations have started to appear. Now, more and more Alaskan residents are searching for viable online gambling entertainment. Here we have compiled a guide to lead you through the complicated nomenclature of the online gambling laws and how they interact with offshore gambling regulations. The information regarding the legality, promos, availability, and various other details can be found right here in this guide. We provide insight into Alaska online casinos, poker sites and sportsbooks, as well as Alaska online bingo options. State regulated online gambling has been left mostly to the discretion of each individual state, in North America. At this time, it is not legal to own or operate an online gambling site of any kind within Alaska’s borders. However, the state of Alaska has never passed any laws that deem it expressly criminal to place bets of any kind over the internet in any way. So while state regulated online gambling is off the table, there is nothing in the state’s statutes that prohibits residents from enjoying online betting at legally sanctioned offshore gambling sites. The only federal laws that impact online betting have never been interpreted to impact the customer placing the bets. They were only written and put in place in order to regulate and manipulate the climate of the online gambling industry and to ensure that it is dealt with in a financially acceptable way. There is no federal law that makes participating in licensed and regulated online gambling illegal in AK. So yes, it is legal to gambling online in Alaska as long as you are careful to only engage in online gambling that at legally licensed and regulated websites, such as the recommended destinations listed in this guide. We provide more detailed information in our guide to understanding Alaska online gambling laws. If you are interested in gleaning additional insight into federal laws, then our guide to understanding United States online gambling laws may prove to be very beneficial for you. Over 20 years ago when we started out in the online gambling industry as insiders and reviewers we never imagined the reach the industry would achieve in such a short period of time. Below you will find all the websites that have become our favorites over the course of our time in the business. We have chosen to recommend these websites based on the impeccable customer reliability and the reputations that they have developed for staying legal and up to date with all their regulations and compliance certifications. Each one of our recommendations is located outside of the US and complies with all international financial regulations. Can I Play Real Money Casino Games Online In Alaska? You absolutely can! It is perfectly legal for Alaska’s residents to enjoy licensed and regulated online gambling at legitimate offshore online casinos that are operating legally within the industry. You will have access to the full range of real money games, including slots, table games such as roulette, craps and baccarat, video poker and specialty games such as keno, bingo and scratchoff games. If you visit one of our recommended destinations, then you’ll also have access to a generous welcome bonus to start things of nicely. Can I Play Poker Online In Alaska? Through a formal opinion of the Department of Justice in 2011 on the Federal Wire Act that clarified its used to only apply to sports betting, some states have recently been allowed to regulate online poker rooms in addition to their casinos. Although none of those states are AK, they provide domestic travel options for anyone who is enthusiastic about online poker. For everyone else in the country including Alaskan citizens, legal, properly regulated online poker rooms exist to offer you a safe place to play all of your favorite variations of the age-old card game. We have a page dedicated to explaining Alaska online poker options and the legalities surrounding this type of gambling entertainment. Can I Bet On Sports Online In Alaska? Despite the federal laws that are in place that function to regulate US based sports betting in a physical and digital sense, placing bets on your favorite sports teams with legal online operators is entirely legal for residents of Alaska. The Professional and Amateur Sports Protection Act limits physical sports betting to only four states, while the Federal Wire Act limits US based online sports betting businesses entirely. If the sportsbook that you are using operates outside of United States legal jurisdiction, you remain completely and legally within your rights to place your bets online. Learn more with our guide to Alaska online sports betting. Can I Play Bingo Online In Alaska? Online Bingo has been on an upswing for a few years now. It is wholly legal to buy your cards and daub your numbers online within the state lines of Alaska, provided that are you using a reputable and legally sanctioned international gambling provider such as the ones listed in this guide. The bingo site that you are visiting must be located physically outside of the US, and be subject to the proper regulation as to satisfy international financial stipulations. 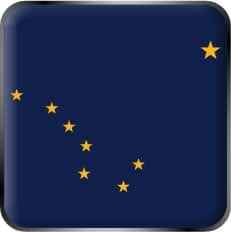 Will AK Legalize Online Gambling In The Near Future? Part of the reason why the Land of the Midnight Sun has hesitated to fully regulate and legalize online gambling businesses is because of the hold on their economy that the major oil companies have. Alaska has been home to some of the largest oil drilling sites in North America for over a decade and all the major oil companies have invested millions of dollars into the economy of Alaska. Tribal casinos haven’t been able to flourish as they have in other states as a result of this. Although our new president made his millions in the gambling industry and seems to be all for gambling of every kind, its still up in there air if the traditionally conservative state of Alaska will move to legalize and regulate state licensed online gambling any time soon.